Wednesday, December 12, 2018, at 9:00 am, at the County Administration Center, 1660 Ringling Blvd. The Benderson project slated for the 24 acres on the northwest corner of Route 41 and Stickney Point Road, consisting of 140,000 sq. 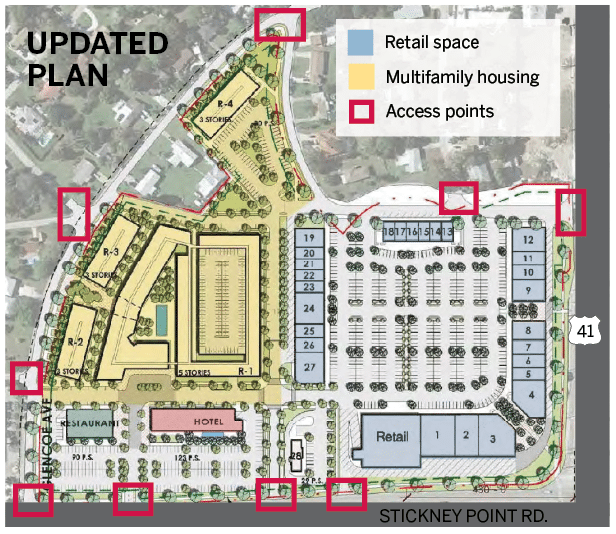 ft of retail, an 80′ tall hotel with 130 rooms and 414 residential condos, will be considered and voted by the County Commissioners. Now is your last chance to appear and be heard, or, submit comments in advance. The community and the Planning Commission have confirmed the significant traffic concerns that currently plague this intersection – this project will add over 12,000 vehicle trips a day to that problem. The Gulf Gate Board fears further gridlock and the potential for our residents to be unable to evacuate or to be reached by emergency vehicles if this traffic worsens. Additionally, the 80′ hotel seems greatly out of character for that location, and will likely set a precedent for future adjacent development. It is our recommendation that this project be scaled back in density and impact.